In her quest, Zélie is joined by her brother Tzain and the princess Amari after Amari's father King Saran kills one of Amari's friends for possessing magic. Crown Prince Inan is sent to stop the trio, though he is himself secretly a maji. The trio, eventually with Inan's assistance, collects all three artifacts necessary for the ritual to restore magic, but are thwarted when Saran's troops catch up to them. Zélie is captured and tortured, rendering her magic quiet. With the help of Tzain and Amari, she manages to escape and they make it to the temple where they can perform the ritual. They are met there by Inan and Saran, who both die in the subsequent fight, and Zelie performs her own ritual which succeeds in revitalizing her magic. Writing the book over 18 months and 45 drafts, Adeyemi drew inspiration from novels like Harry Potter and An Ember in the Ashes as well as West African mythology and the Yoruba culture and language. The hopelessness she felt at police shootings of black Americans also motivated her to develop the story of Children of Blood and Bone. The book received one of the biggest young adult publishing deals ever, including preemptive sale of film rights to Fox 2000. Debuting at number one on The New York Times best-seller list for young adult books, the novel received mostly positive reviews. Critics wrote about its examination of oppression, racism, and slavery, with the kosadan and maji serving as stand-ins for real-world groups. It is also a coming-of-age story as the characters discover their abilities to help shape the world through their actions. Tomi Adeyemi had worked unsuccessfully on a manuscript for three years before beginning Children of Blood and Bone. The idea for the novel came after a trip to Brazil: "I was in a gift shop there and the African gods and goddesses were depicted in such a beautiful and sacred way ... it really made me think about all the beautiful images we never see featuring black people". Her desire to write an epic tale with roots in West Africa was matched by her desire to respond to police brutality. The spate of police violence against black Americans had a large impact on Adeymi; she wanted to escape the helplessness and fear she felt: "What is the point if my life ends at the barrel of a police officer’s gun?" In the author's note at the end of the novel, Adeyemi makes a call to emotion, telling the reader that "if [they] cried for Zulaikha ... cry for innocent children like Jordan Edwards, Tamir Rice, and Aiyana Stanley-Jones." Adeyemi drew inspiration from Yoruba culture and Western fantasy fiction like Harry Potter and Avatar: The Last Airbender and from both West African mythology and the Black Lives Matter movement. She has also cited the books Shadowshaper and An Ember in the Ashes as primary inspirations. Finally, Adeyemi was also affected her by the backlash against the black characters in the film The Hunger Games: she wanted to write a story so good even racists would want to read it. Adeyemi worked as a creative writing coach while she wrote the novel. While her first draft had major sections of the story omitted, the second draft, which she was ultimately forced to complete in a month to enter it in a writing competition, was where she felt it needed to meet her expectations. For Adeyemi there was no option but for the book to be successful and perfect, given the pressures placed on black creators: "I’m not going to put Zélie’s face on the cover of this book and give you anything less than an incredible story, because for the kids who have never seen themselves, they need to see that, and they need to know that they are beautiful and that they are powerful". She wrote the book while bingeing the television show The Good Wife in the background. She became so exhausted through the non-stop work of the writing that she became disoriented, even at one point thinking she was a lawyer. The entire editing process took eighteen months to complete, going through 45 drafts. As in the J.K. Rowlings' Harry Potter series, Adeyemi wanted to build a complete world, though she did not like when she was called the "black J.K. Rowling", preferring instead phrases like "the new J.K. Rowling". She worked hard to map the distances between cities and the time it would take a horse and lion to travel between them, as well as reasoning through the logical implications of her creative choices, such as having characters ride big cats. She also had to figure out parallels in her imagined world to issues like skin bleaching, which would not exist in a world without white people. She got help from her Nigerian mother at times for things like naming the spells that involved use of the Yoruba language. Adeyemi entered Pitch Wars, a competition that matches emerging writers with mentor editors and authors to revise their work before submitting them to literary agents. She came to be represented by Alexandra Machinist and Hillary Jacobson of ICM Partners. In 2017, publishing rights to The Children of Blood and Bone sold as a trilogy to include two more books, and rights to the film adaptation sold to Fox 2000. Reportedly these deals came to seven figures, with Deadline describing it as "one of the biggest YA debut novel publishing deals ever." Adeyemi was 23 at the time. Children of Blood and Bone was published on March 6, 2018, by Henry Holt Books for Young Readers after being called "the biggest fantasy debut novel of 2018" and one of the most anticipated books of the year. A sequel, Children of Virtue and Vengeance, will be published in June 2019. The novel introduces the land of Orïsha, where King Saran rules over two conflicting cultures: the maji, who have unique magical abilities, have always been oppressed by the elite kosidán, the nobles. Most of Saran's family was killed by maji unhappy with efforts to unite the maji and kosidán. Following his accession to the throne, Saran ordered raids that killed the maji, rid the land of magic, and cemented kosidán rule. The Children of Blood and Bone takes place eleven years later. Zélie Adebola is a divîner, or one who has magical blood, and serves as one of three point-of-view characters. Her mother was a maji killed in the raids and her father is a kosidán. Zélie is not a maji because magic no longer exists; however her white hair still marks her as a divîner, someone who could become a maji, and she has been trained by a hidden divîner, Mama Agba. Following an incursion by some guards demanding payment, Zélie and her family become afraid that she might be sent to the stocks, where maji who are unable to pay the taxes placed on them are sent to work in a kind of indentured servitude, including sometimes to death. Zélie and her older brother Tzain, an accomplished player in a popular sport called agbön, go to the capital, Lagos, to raise money to pay the taxes. While there, Zélie sees a girl, Amari, who is the second point-of-view character. She is Saran's second child but fled the palace following the killing of her friend and servant, Binta, a divîner. Binta was killed after being forced by Saran and Kaea, an admiral in the armed forces and Saran's secret lover, to touch a magic scroll revealing her magical powers. After Kaea's failed attempt to destroy the scroll, in an attempt to prevent magic from being restored, Amari stole it as she fled, causing guards to give chase. The captain of these guards is Inan, the crown prince and Amari's older brother and the third point-of-view character. Amari and Zélie escape the city but not before Inan touches the scroll, revealing that he too has magical powers. The trio of Zélie, Tzain, and Amari are encouraged by Baba, Zélie's father, to seek out the temple of the maji, Chândomblé. Though pursued by Inan, Kaea, and a contingent of guards, the group successfully finds their way to the temple. There they learn that a ritual must be performed once every hundred years to renew the connection between the maji and Sky Mother, the mother of all the other gods. In addition to the scroll, the group needs two other key artifacts in order to perform this ritual: a sunstone, connecting Sky Mother to the earth and the maji holding it, and the blood dagger, which the last remaining priest of Chândomblé gives to the group. He performs a rite on Zélie so she will be able to complete the connection, and then he sacrifices himself to hold off the guards as the trio escapes. Using his newfound magical abilities as a connector (a maji who can explore feelings and memories), Inan enters a dreamscape and make a connection with Zélie, allowing him to track the progress of the trio. Kaea catches Inan using these abilities and in the confrontation which follows, Inan accidentally uses his magic to kill her before leaving to track the group to Ibeji. In Ibeji the sunstone is being used as a prize for slave games in a colosseum, so Zélie agrees to compete, leading a ship of slaves against 19 other ships. Tzain takes control of leading the ship, while Zélie uses her power as a reaper, or a divîner of the dead, to give them an advantage. Amari, who previously refused to participate in sparring matches staged by Saran pitting her against Inan, helps seal the victory by killing the last captain before he can kill Zélie. Now in possession of all three artifacts, the group continues on their way until Inan catches up to the group. In the chaos that follows, Tzain and Amari are captured in the forest by an unknown group. Inan agrees to help Zélie rescue their siblings. During the rescue, the pair learn that the group is really a settlement of divîner, some of whom have had their powers reawakened when they were exposed to the scroll before it was recaptured, including their leader Zu, a healer. Upon hearing of the group's mission, they decide to hold a festival for the Sky Mother where the remaining divîner will be able to touch the scroll. By this time, Inan, who has developed romantic feelings for Zélie, has agreed to help restore magic, having come to value divîner, who are known by many kosidán as maggots. For Inan, this offers a way to unite his future kingdom and eases his self-hatred over being a divîner. When Tzain sees Inan and Zélie kissing, he leaves the camp in anger along with Amari, the two having developed their own romantic connection. Saran's guards find and destroy the camp, also capturing Zélie. During the fight between the guards and the divîner, Kwame, a burner, or divîner who can control fire, uses blood magic, a powerful but dangerous way for divîner to increase the power of their magic, to self-immolate and take out some guards with him. This display of unchecked magic scares Inan, who back in the palace with his father, once again goes to efforts to contain and repress his magic, knowing that his father would kill him should he ever reveal that he is a maji. Inan, to Zélie's surprise, tries to get Zélie to reveal how to destroy the scroll and to find out its location. This session is interrupted by Saran, who orders Zélie tortured by having "Maggot" carved on her back. Inan, disgusted by this and having lingering feelings for Zélie despite his overall distrust of magic, finds an opportunity to break her out of the palace; by chance this coincides with an attack lead by Tzain, Amari, and some divîner Tzain knew through agbön, who awaken their own powers using the scroll. Zélie, now free, finds that she can no longer use her powers, but does not share this with anyone else. Still believing it is possible to restore magic, this larger group heads to the free but lawless city of Jimeta where they hire a group of mercenaries, lead by Roën, a pickpocket from the divîner camp. Through the mercenaries' skill, they are able to infiltrate the island and temple to perform the ceremony. Once there, however, Zélie, Tzain, and the rest are ambushed by Saran and Inan, who are holding Baba hostage and have killed Mama Agba. Feeling helpless as she cannot use any magic, Zélie agrees to give the artifacts up in exchange for her and her father's life. As Zélie leaves temple, Saran orders her father killed anyway. The spirit and blood magic of her father reawakens Zélie's magic and she uses her restored powers to attack the kosidán. Inan uses her rage and magic to his advantage, as he provokes an attack which is able to destroy the scroll. But in the ensuing battle, Inan sees a mercenary who is about to kill his father and without thinking, Inan uses his magic to stop this. This causes Saran to turn on and kill his son. Furious, Amari then turns and kills her father. Unable to repair the scroll, and thus complete the ritual to restore the connection with magic, Zélie uses blood magic and an incantation of her own devising to complete the ritual and which apparently kills her in the process. Zélie is then able to speak with her mother, speaking on behalf of the gods in the afterlife, who praises her and sends her back. The book concludes as Zélie learns that Amari now has magic. The conflict between the kosidán and maji, with the kosidán possessing lighter skin and having enslaved segments of the maji, raises issues of race and class and how these can be used to divide a nation. Class ultimately becomes a stand-in for race in the book. The story does not shy from showing the way that power can be bound up with brutality. Saran feels that the only way to maintain control both personally as well as for his race is through oppression and enslavement of the minority. For Saran it is not enough to control the maji; he must also extinguish their hope and threaten genocide. Throughout the book, the maji respond to this oppression in different ways. Zélie, who has seen her mother killed, her father beaten, and her own freedom jeopardized at the hands of guards, or the police, offers one reaction with her determination to resist and overthrow the social order, offering a model for real life black activists. Inan, as both a maji and kosidán, has a different reaction, instead, wanting to see the two peoples united. The magic of the maji also serves as a connection between humanity and the gods. The novel also tells a more intimate story as children struggle to win their parents' approval. Inan wants to fulfill his duty to his father and kingdom in order to be a good prince, but is also a maji himself and has a personal connection to other maji through Zélie. The complexity of teenagers who are eager to jump into the adult world and adult problems is also present in the novel as adolescents attempt to discover themselves. While they struggle with the weight of these obligations, the point-of-view characters in the book are able to demonstrate wisdom, courage and compassion beyond that of the adults they are seeking to please. Ultimately, it's the female characters who survive trauma and show the way forward. While Zélie initially mistakes Amari as weak, it becomes clear Amari has learned other coping strategies while surviving under her abusive father. There is a great deal of loss in the book, with several characters, including Inan, dying, but Zélie and Amari continue in their efforts. 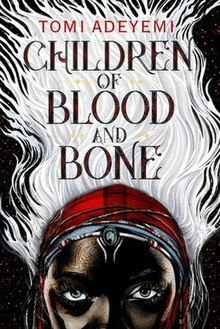 Children of Blood and Bone has received generally positive reviews, debuting at number one on The New York Times best-seller list for young adult books and receiving praise from the newspaper for how "it storms the boundaries of the imagination. Yet it also confronts the conscience." A starred review from Publishers Weekly lauded the novel for its complex characters and kaleidoscopic narrative. Kirkus, which gave the book a starred review and nominated it for the Kirkus Prize, called it, "Powerful, captivating, and raw." Charisse Jones of USA Today praised the novel, giving it four out of four stars: "While Tomi Adeyemi's Africa-inspired fantasy was written for young adults, readers of all ages will be captivated by this engrossing tale". David Canfield of Entertainment Weekly called the novel a "phenomenon" owing to the success of a first-time author. Author and poet Kiran Millwood Hargrave in The Guardian praised, "the hate-to-love romance [that] comes with high stakes, and the relationship is realistically and passionately realised. All of it is packaged in a tightly plotted, action-packed adventure." Less positively, The A.V. Club said the book failed to live up to its hype, criticising the way magic works in the novel and its length. In 2018, the viewers of The Tonight Show Starring Jimmy Fallon selected Children of Blood and Bone as the first ever "Tonight Show Summer Read". Adeyemi later appeared as a guest on the Tonight Show on July 24, 2018 to discuss the book. An 18 hour audiobook narrated by Bahni Turpin was released in March 2018. The audiobook was well received. It won the 2019 Audie Award for best audiobook and was a runner-up for best Young Adult audiobook. "There's something magical about the timbre of Turpin’s voice that's perfectly tuned to the fantastical nature of this novel. I felt transported into the world of Children of Blood and Bone," said Ron Charles, a judge for the award. In a starred review, Hayley Schommer writing for Booklist complemented how the "pacing of the novel is further complemented by Turpin’s own, appropriate adjustments in pace." Maggie Knapp in School Library Journal wrote of Turpin's ability to provide unique and distinguishable voices for both the main and supporting characters. Publishers Weekly's starred review also praised Turpin's work, "Turpin’s bold reading of Adeyemi’s Afro-futurist fantasy solidifies her reputation as one of the best voice actors working today." AudioFile magazine named it one of the best audiobooks of the year, praising Turpin's voices and her abilities to capture other elements of the novel, such as Yoruba incantations. Prior to publication, Children of Blood and Bone was optioned for a film adaptation produced by Fox 2000 and Temple Hill Productions. Adeyemi had appreciated the work Fox 2000 had done in producing Love, Simon and that they were the studio adapting The Hate U Give to film. In February 2019 Rick Famuyiwa was announced as the director. Adeyemi has said her dream cast would have Idris Elba in the role of Saran and Viola Davis playing Mama Agba. ^ a b c d Lawrence, Shammara (2019-03-19). ""Children of Blood and Bone" Author Tomi Adeyemi on Creating a World Where Readers of Color Can See Themselves". Teen Vogue. Retrieved 2019-02-01. ^ a b c Hughes, Sarah (March 10, 2018). "Tomi Adeyemi: 'We need a black girl fantasy book every month'". The Guardian. Retrieved May 12, 2018. ^ a b c d Rockett, Darcel (2018-06-28). "Meet Tomi Adeyemi, a former Hinsdale resident who won Jimmy Fallon's first book club contest". chicagotribune.com. Retrieved 2019-02-01. ^ a b c d e f Thompson, Eliza (2018-03-08). "Tomi Adeyemi on Writing the Biggest YA Novel of the Year". Cosmopolitan. Retrieved 2019-02-01. ^ Tomi,, Adeyemi,. Children of blood and bone (First ed.). New York. ISBN 9781250170972. OCLC 990287971. ^ a b c d e Canfield, David (March 5, 2018). "Meet Tomi Adeyemi, the YA breakout of 2018". Entertainment Weekly. Retrieved May 10, 2018. ^ Haque, Fahima (March 29, 2012). "Watching 'The Hunger Games' through a racial lens". The Washington Post. Retrieved May 13, 2018. ^ Wols, Lauren; Eck, Everett; Anderson, Hannah (March 21, 2018). "New author Tomi Adeyemi visits her alma mater". Hinsdale Central High School (Hinsdale, Illinois). ^ Gentry, Baihley (2018-02-07). "Interview with Tomi Adeyemi, Author of 'Children of Blood and Bone'". WritersDigest.com. Retrieved 2019-04-08. ^ a b c Canfield, David (2018-04-13). "Is Tomi Adeyemi the new J.K. Rowling?". EW.com. Retrieved 2019-02-01. ^ Kembrey, Melanie (March 9, 2018). "Interview: Tomi Adeyemi and her fantasy novel inspired by Black Lives Matter", The Sydney Morning Herald. ^ a b c Fleming Jr, Mike (March 29, 2017). "Fox 2000, Macmillan Land African Flavored Fantasy Novel 'Children Of Blood And Bone' In Splashy Deal". Deadline Hollywood. Retrieved April 16, 2017. ^ Danielle, Britni (March 30, 2017). "Tomi Adeyemi's Debut Novel Heading to the Big Screen in Blockbuster Deal". Ebony. Retrieved April 16, 2017. ^ Rosen, Judith; Roback, Diane; Sellers, John A.; Nawotka, Ed (April 14, 2017). "A Big Week for Children's Book Publishing". Publishers Weekly. Retrieved April 16, 2017. ^ Shapiro, Lila (2018-02-23). "Watch the Book Trailer for Tomi Adeyemi's Children of Blood and Bone, One of the Biggest Deals in YA History". www.vulture.com. Retrieved 2019-02-01. ^ "The Most Anticipated Children's and YA Books of Spring 2019". www.publishersweekly.com. Retrieved 2019-04-08. ^ a b Swan, Jennifer Hubert (2018-03-02). "New Y.A. Books Rewrite Old Cultural Scripts". The New York Times. ISSN 0362-4331. Retrieved 2019-02-01. ^ a b c d e f g h Cheeran, John (2018-03-28). "These Children of Blood and Bone are real". Times of India Blog. Retrieved 2019-02-01. ^ Paxson, Caitlyn (2018-03-10). "'Children Of Blood And Bone' Is A Feast For Hungry Readers". NPR.org. Retrieved 2019-02-01. ^ a b c d e Jones, Charisse (March 13, 2018). "Riveting African fantasy 'Children of Blood and Bone' is ready for its movie close-up". USA Today. Retrieved May 12, 2018. ^ a b c Newkirk II, Vann R. (2018-03-06). "Where Fantasy Meets Black Lives Matter". The Atlantic. Retrieved 2019-02-01. ^ a b "A teen fiction sensation about race and police brutality". The Economist. 2018-05-10. ISSN 0013-0613. Retrieved 2019-02-01. ^ a b "Children of Blood and Bone review". Kirkus Reviews. February 5, 2018. Retrieved May 12, 2018. ^ Jordan, Tina (March 16, 2018). "Is Your Plane About to Crash? Write a Farewell Note and Eat It". The New York Times. Retrieved May 12, 2018. ^ "Children's Review: Children of Blood and Bone". Publishers Weekly. January 1, 2018. Retrieved May 12, 2018. ^ Hargrave, Kiran Millwood (2018-03-07). "The Children of Blood and Bone by Tomi Adeyemi review – a YA fantasy inspired by west Africa". The Guardian. ISSN 0261-3077. Retrieved 2019-02-01. ^ Nelson, Samantha. "Children Of Blood And Bone is less a novel than a YA movie franchise in waiting". The A.V. Club. Retrieved 2019-02-01. ^ Liptak, Andrew (2018-06-30). "Jimmy Fallon will kick off Tonight Show book club with YA fantasy Children of Blood and Bone". The Verge. Retrieved 2019-02-02. ^ a b "Children of Blood and Bone". www.publishersweekly.com. Retrieved 2019-04-08. ^ a b "2019 Audie Awards® - APA". www.audiopub.org. Retrieved 2019-04-08. ^ Schommer, Hayley (2018-08-13). Children of Blood and Bone, by Bahni Turpin | Booklist Online. Booklist. Retrieved 2019-04-08. ^ Knapp, Maggie (2017-07-01). "Children of Blood and Bone". School Library Journal. Retrieved 2019-04-08. ^ "CHILDREN OF BLOOD AND BONE by Tomi Adeyemi Read by Bahni Turpin | Audiobook Review". AudioFile Magazine. Retrieved 2019-04-08. ^ Waters, Michael (2018-03-05). "'Children of Blood and Bone' Author Tomi Adeyemi Calls YA Debut "'Black Panther' With Magic"". The Hollywood Reporter. Retrieved 2019-02-01. ^ N'Duka, Amanda; N'Duka, Amanda (2019-02-21). "Rick Famuyiwa To Direct 'Children of Blood and Bone' At Fox 2000". Deadline. Retrieved 2019-03-23. This page was last edited on 9 April 2019, at 18:17 (UTC).